From left: Dekarius Dawson, Dennese Adkins, Christopher MacRae, John Lackey, Rachael Foster, Anthony Dutton, Tori Rudolph, Chandler Reid Evans, Prof. David Malis, Mickel Gordon and Jason Burrow. 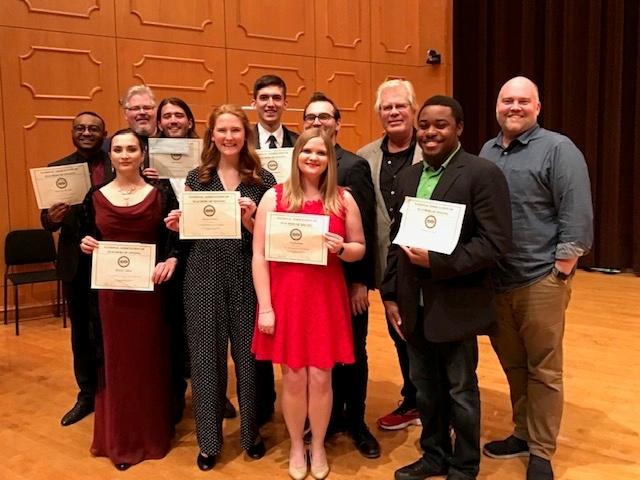 Twenty music students represented the University of Arkansas at the National Association of Teachers of Singing (NATS) Southern Region Conference held Nov. 8-10 at Northwestern State University in Natchitoches, Louisiana. Made up of music performance and music education majors, these voice majors study with UA faculty members Jason Burrow (Theatre), Christopher MacRae (Music), David Malis (Music), and Moon-Sook Park (Music). The NATS conference, which is a regional conference of Arkansas, Mississippi, and Louisiana, hosted around 400 students as they competed in a variety of categories and attended lectures and presentations on vocal health, Russian diction, and new song repertoire. Special thanks to Hyun Kim and Lisa Auten who attended the conference as collaborative pianists for the U of A students. Thanks to Ronda Mains, chair of the Department of Music, for providing financial support to the trip to Louisiana. The public will have the opportunity to hear these fine young singers in the Department of Music's Vocal Area Awards Recital held at 7:30 p.m. Friday, Nov. 30, in Stella Boyle Smith Concert Hall.